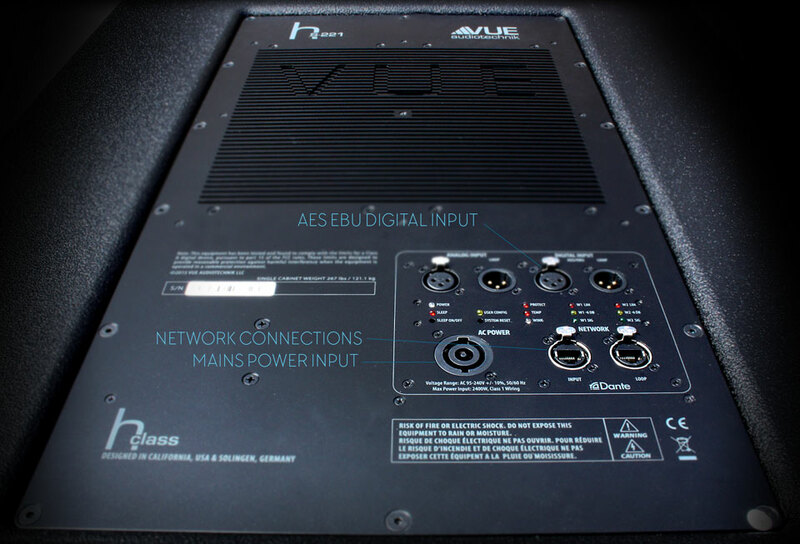 The hs-221 utilizes VUE’s revolutionary Active Compliance Management (ACM) technology to reset the size-to-performance benchmark for subwoofer systems. The combination of ACM technology and the hs-221’s highly-sophisticated on-board electronics result in massive amounts of pure, clean low-frequency energy from a dual 21-inch configuration that embodies a significantly smaller enclosure than other dual 21-inch designs. 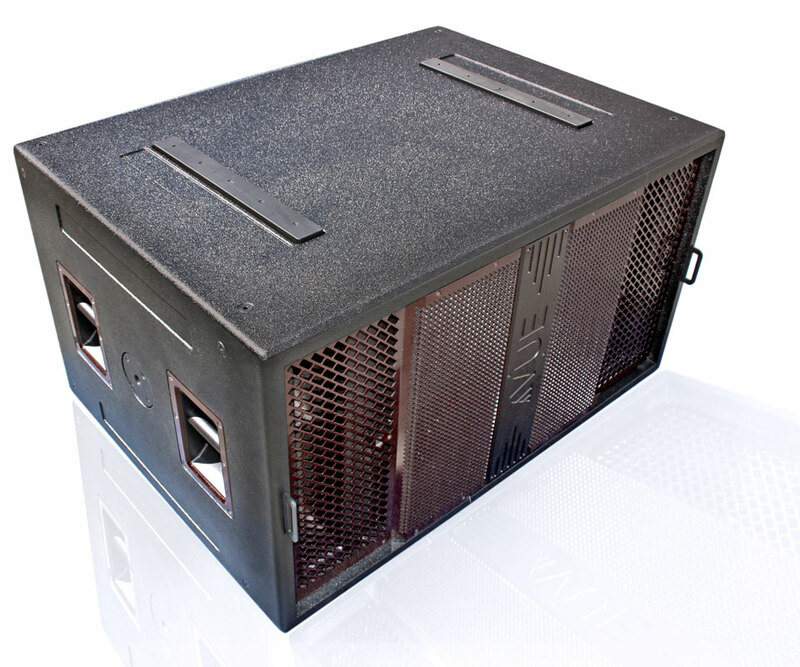 VUE’s patent-pending ACM technology combines both band-pass and vented alignments into a single enclosure. The hs-221 places two high performance, 21-inch transducers into this configuration, with both woofers sharing a common vented chamber. One woofer’s frontal radiation is direct, while the second woofer’s frontal radiation drives the band-pass chamber. 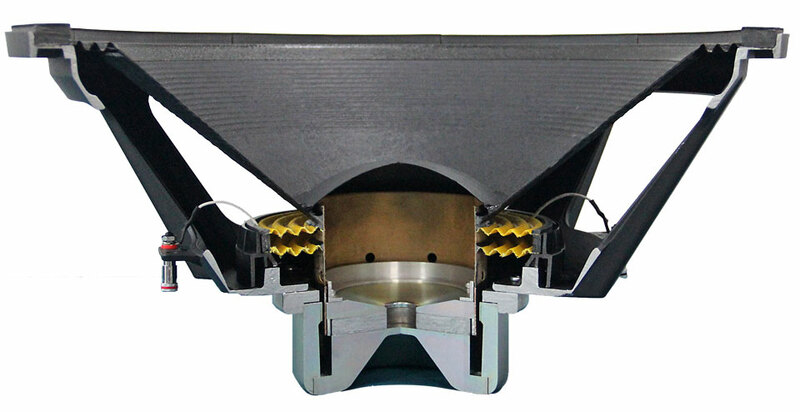 The hs-221 places two high performance, 21-inch transducers into this configuration, with both woofers sharing a common vented chamber. One woofer’s frontal radiation is direct, while the second woofer’s frontal radiation drives the band-pass chamber. To make the two ACM subsections combine acoustically we use sophisticated DSP to precisely align the phase arrivals of the front facing woofer, the common chamber vent, and output of the band-pass chamber vent. The powerful amplifier sends 1,000W of pure sine wave power (5,000W “burst” ) with a unique optimal signal to each woofer. The combination of 5,000 watts of burst power produces 143 dB SPL peak output in free field (149 dB SPL half space – ground plane environment). The combination of ACM, precision-engineered transducers, and sophisticated electronics, allow the hs-221 to deliver very high output while providing flat response down to 27 Hz (in ELF mode). 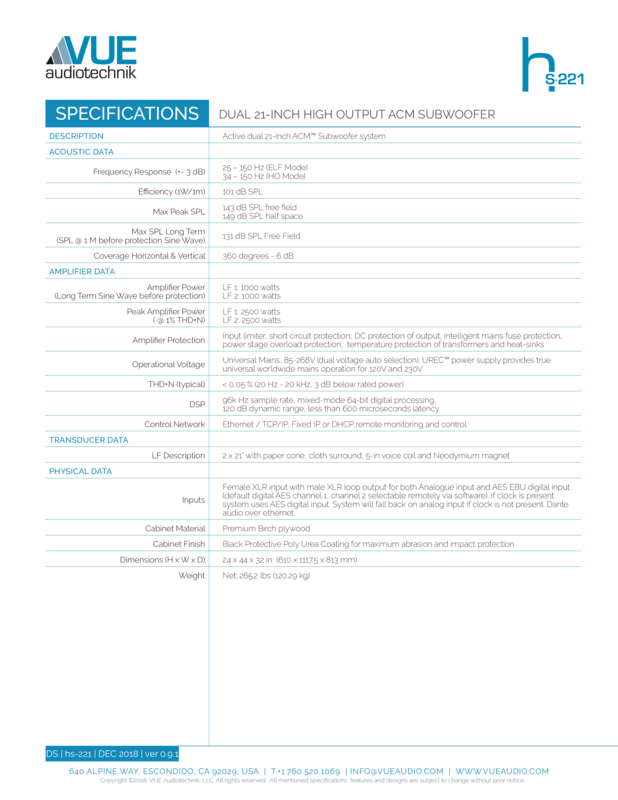 The hs-221’s enclosure has a more compact footprint than most dual 21-inch systems and even some dual 18- inch designs. If the hs-221’s DSP detects a viable digital signal (via AES EBU digital input and loop through via XLR connectors) it will use that signal and mute the analog input. If the digital signal is lost, the DSP will automatically fall back to the analog input in order to avoid interruptions. The default is AES channel 1, however SystemVUE software allows users to remotely access each hs-221 on the network and select AES digital channel 2 or a mono sum of channels 1 and 2. SystemVUE can also select the Dante input from the network connection. hs-221’s are equipped with two RJ-45 Ethernet connectors (with an internal switch for loop through network connections). The hs-221 supports remote control and monitoring over ethernet via SystemVUE software. 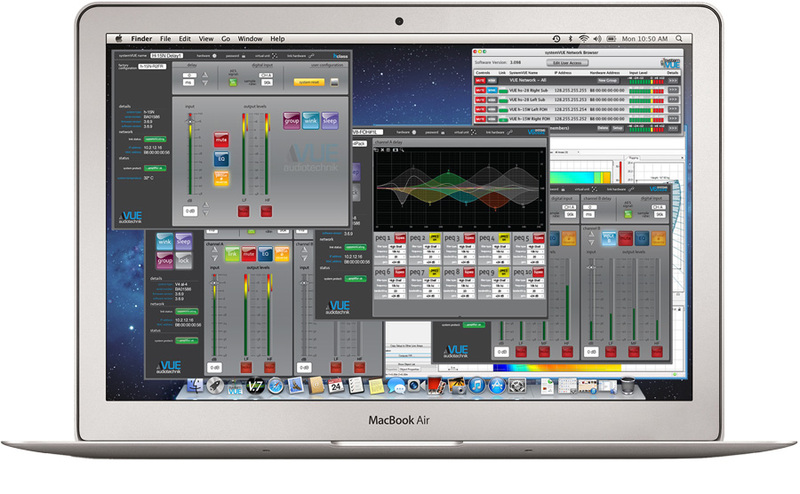 The Ethernet connection also can be used for Dante Network Audio Streams input (electable via SystemVUE Software). Like all h-Class systems, the hs-221 ships with networking capabilities already on-board. There’s no need for additional cards or retrofitting. VUE uses standard IP protocols to simplify the networking process. Simply plug in and the hs-221 will automatically connect to virtually any kind of IP configuration. Users can then access and monitor network and device-level parameters through our SystemVUE™ software. The Ethernet connection also allows the use of Dante® for audio transport. The hs-221 uses a Neutrik Powercon connector. The hs-221 low frequency transducers vitalize a new purpose designed state-of-the-art high output long excursion 21-inch transducer. The driver is manufactured by VUE and features a massive neodymium (NdFeB) magnet circuit, 5 -inch voice coil and dual spider suspension.